The ultimate product of Dr. Gero. Encompassing DNA from various heroes and even villains, he's perfect! 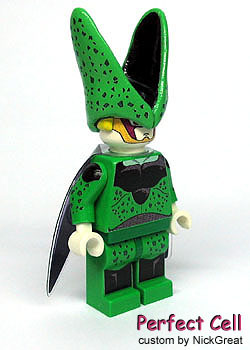 This is the third incarnation of Cell. - Headgear made with Sculpey over a modified LEGO classic space helmet. - Wings printed on transparency. Lego...MAKE THIS NOW!!!! !Put this on Lego Ideas PLEASE!!!!! This is TOO good!!!!! THe wings and herad are my favorite parts!! dang!!! that is so cool!!! the helmet exacly like in the shows!!! The Bulma model was made to incredible detail, but this was made to divine perfection! OMG!!! 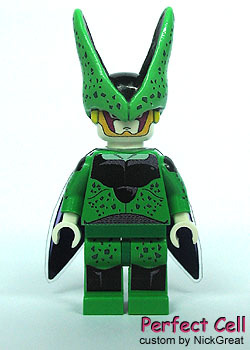 Cell is my favourite dragonball Z character! I never thought i would see him done in lego , or as good as this one. 10 out of 10 for this one!! This is to good for this world and should be 1 million of 5. awesome. cool. good. exellent. whatever. excellent job. did you ever watch guyver. plz review mine. DO you hand make all the parts for you dbz minifigs? Or do you create custom decals and such, and if you do, i was wondering where one would go to get such things done. PLEASE send me one PLEASE! I must have it! Or send me decals*, paint brand, where to get supplies, and how to make decals, THANKS! hands down bloody awesome! this gotta be my favourite of all your customs! keep it coming nick! Wow! This is just awesome!!! Where did u get one? Or how did u made one? plzz Tell me :D! Oh, my GOD!!! This is just perfect! I'm actually, or was, a big fan of Dragonball, this sure is awesome.